YOU were born in Thracia beneath the walls of Philippopolis, where snow-capped mountains rise to the south and a bright sun warms fields of pale corn. Your world is a warm world; your rivers cool rivers. Your winds sweep from the Aegean with the scents of the sea, or roll down from the north bringing winter from the Urals. At a young age, when your limbs were supple and your muscles strong, you enlisted in the First Cohort of Thracians. You marched across Europe, from one side of the Roman Empire to the other. 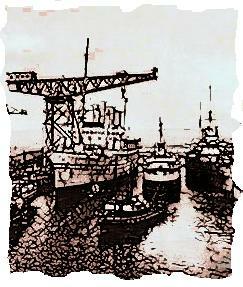 You embarked on a ship and you sailed across a cold grey sea to a cold grey land. And after many days of marching along straight roads choked with autumn leaves, you arrived at your final destination, dropped your pack and your weapons on the barracks floor, and said a prayer to the Goddess Fortune and Virius Lupus, legate of the emperor. Welcome to Lavatris, a forgotten outpost in a land of bleak, waterlogged moors and wide skies. Your task is to guard the road that runs from Cataractonivm, 16 Roman miles to the east, over the Pennines to Verteris, 14 Roman miles to the west. 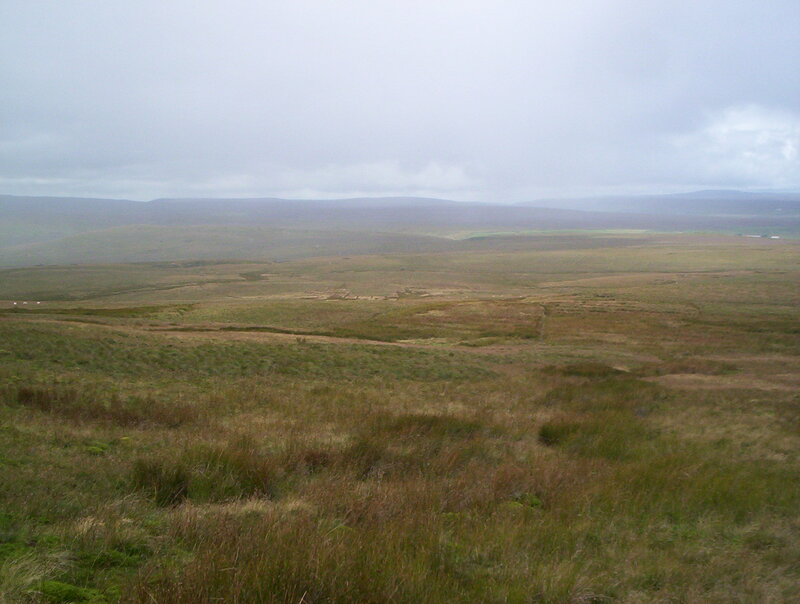 And when you stand on the summit of Stainmore – your boots brimming with mud and peaty water, the wind whipping your sodden cloak – you will dream of the land of your birth. The land you will never see again. How do you feel about that? Bad decision? Today, though, in the heather above Gilmonby and Bowes, I have sunshine. Lavatris is the Roman fort at Bowes, on the A66 – 16 Roman miles from Catterick in the east, and 14 Roman miles from Brough in the west. I make a mental note to look up Lavatris on the internet, just to see what the name means because it sounds like a joke from Up Pompeii. The military mind is such a wonderful thing, so inventive – and occasionally so cynical. We have in Britain a legacy of wonderful names, especially pub names and farm names, that have their origins in campaigns fought in all corners of the empire (there is a Waterloo Farm behind my house). This tradition is also common in the naming of the mines and quarries scattered about our hills. The more bloody the battle, the more heartbreaking or futile the circumstances, the more likely the name is to be found tucked away in the corner of some ageing Ordnance Survey map. For instance, there are several quarries in the Lake District called Spion Kop, after the notorious defeat inflicted on the British – under the unfortunate General Sir Redvers Bullers – by the Boers. That, I do believe, is also where the Anfield Kop gets its name – from surviving members of the Lancashire regiments (Second Battalion Lancashire Fusiliers, the Second Battalion the Royal Lancaster Regiment and the First Battalion the South Lancashire Regiment) who fought in the battle. There are other examples of where human conflict has been immortalised in the names of pits and quarries (Alma, Sebastapol, Plevna spring to mind). One of the most recent comes from the Burlington Slate Quarries near Kirkby–in-Furness (which, incidentally, also have a Spion Kop). The road constructed during the 1950s from the quarries to the main road above Grizebeck was Christened – and is known to this day as – the Burma Road. This is good, old-fashioned, working-class irony. The poor fellas who slogged up to the Old Man quarries above Coniston every day of the week, did they take a conscious decision to name their quarry Spion Kop (there is also a Spion Kop quarry at Threlkeld)? Had some of them fought in the Boer War, in those Lancashire regiments on that bloody hilltop, and cynically drawn a parallel between the conflict and the god-awful place in which they later found themselves working? After all, Coniston was part of Lancashire in those days. And I’m sure the quarrymen who bulldozed the Burma Road named it with a wry laugh, some having just returned from the Far East. So, Lavatris. It’s such a pleasant place today. Only Jupiter knows what the Roman foot soldiers thought of it as they slogged up the A66 through the peat haggs and dirty weather to find themselves stationed on a slope of the eternally unappealing Stainmore. It must have seemed like the edge of the world – and in some ways it was. Anyway, getting down to business. I leap off like a Roman soldier, bloody Ben Hur, up High Green Fell on the side of Gilmonby Moor, and along the edge of a wood called Hong Kong Plantation. Now that’s an interesting name: Hong Kong Plantation. Is this an agricultural version of the Burma Road, I wonder? I pass Eller Beck Hush, which is an unexpected and rather fine example of a lead mining hush. 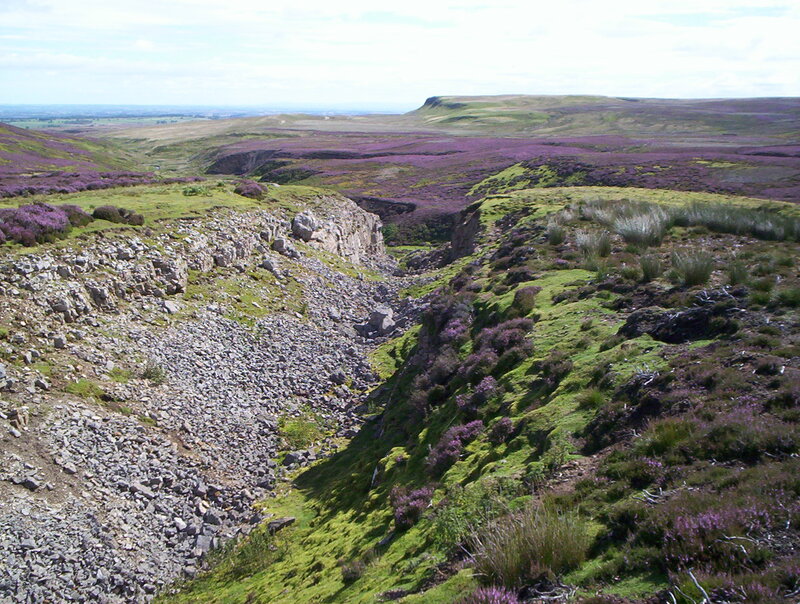 These hushes are quite common in the Pennines – they are opencast workings along the mineral vein, where the rock has been gouged away by huge volumes of water released from reservoirs. After passing a line of shooting butts, my path peters out in the heather and bogs, though I wander on south-west into Arkengarthdale, heading for the romantically named Mud Beck. It is my plan to intersect the Tan Hill pub road and return along the Pennine Way, though in the swamps of Mud Beck valley I lose the inclination, disheartened by the colossal drabness of my surroundings. I st rike a faint path heading north to Sleightholme Farm as conditions deteriorate and gloom increases. The return from Sleightholme along the Pennine Way and into Bowes is quite pleasant, though at East Mellwaters Farm I am engulfed in the most horrendous shower. Even the sheep rush for shelter behind a barn as the rain scythes in from Cumbria. I’ve never seen sheep do this before. It’s probably an indication of how torrential the rain is. My heart goes out to those poor Roman soldiers, slogging through weather like this in their dripping armour and heavy clothes – across the untamed boglands and through the incessant mud. Not a bit like Thracia. What a bloody shite hole, they must have thought, this bloody Lavatris. This entry was posted in Hiking, Walking and tagged Mining History, Pennines, The Lakes. Bookmark the permalink.